Sift wheat flour, add salt, turmeric powder, ajwain, and red chilli powder and mix well. Add oil and mix into the flour then knead into dough of roti like consistency. Set aside. 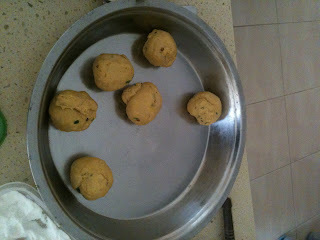 Wash Toor dal and pressure cook it for three whistles. Allow to cool. 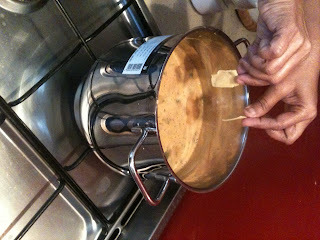 Heat the oil and ghee in a pot, add the cloves, cinnamon and mustard seeds. When they crackle add the curry leaves, green chillies and a pinch of asafoetida. 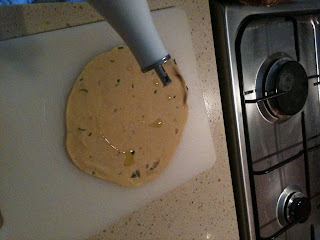 Pour this tempering over the Toor dal. In a bowl mix tamarind and brown sugar water, groundnut, garam masala and the red chilli powder and mix well. Add the tomato pulp, turmeric powder, salt and 2 cups of water. Bring the Dal to a boil. 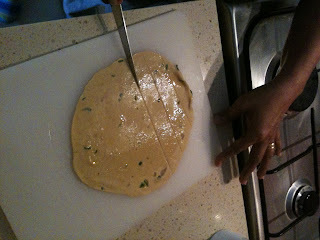 In the meanwhile roll out big rotis and cut them into diamond shapes, and add to the boiling dal. Boil for 10 minutes and remove from flame. Garnish with cilantro leaves and serve immediately with finely chopped onion, wedges of lime and Ghee.